Be informed with world class GPS commentary of Sydney's famous sights. If you’re looking to spend a great day out on Sydney Harbour, look no further than Magistic Cruises for the experience of a lifetime. Our stately Australian-built luxury catamaran, the Magistic Two offer fantastic buffet lunch cruises along Sydney Harbour. 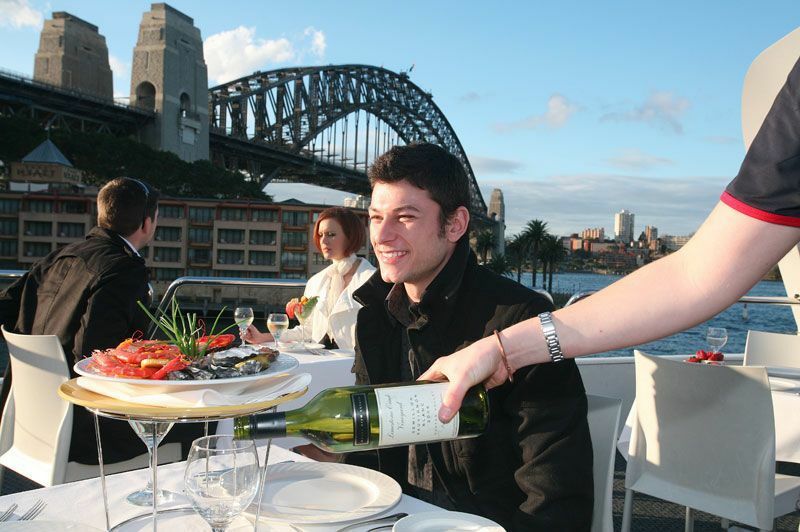 This lunch cruise in Sydney is a must-do for both locals and tourists as it offers restaurant-quality ambience laced with luxury, a gourmet seafood buffet lunch, premium beverages and a spectacular view of Sydney's star attractions. Steer clear of the teeming crowds ashore and enjoy the architectural marvel that is the Sydney Opera House, the Harbour Bridge and Luna Park from the expansive decks of the Magistic. You'll have photo opportunities galore to capture memories you can treasure for a lifetime. Spend the afternoon leisurely unwinding on the decks of our luxurious catamaran, sipping on refreshing drinks as you cruise around Sydney Harbour. 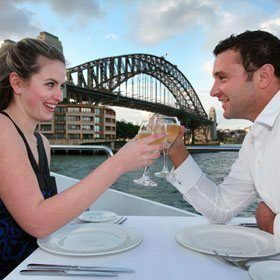 The Magistic luxury Sydney Harbour lunch cruise is for two hours, but guests have the option to disembark after this or continue on an exclusive two-hour sightseeing cruise at an additional cost of just $17.50. Also note that the cruise extension only includes sightseeing and food will not be served during this interval. So, if you’re in Sydney, don’t let the Magistic pass you by; make sure you’re on it! The Magistic Two is purely Australian in design, construction and management. It boasts the latest in marine engineering, modern comfort and classic elegance. Popularly known as the 'Coat Hanger', the Harbour Bridge, built in 1932, is one of the world's most imposing bridges that serves as the lifeline between Sydney CBD and the residential North Sydney. The Sydney Opera House, with its soaring sails, is a World Heritage building and a landmark that is the face of Sydney. It hosts more than 1600 performances a year and houses multiple stages, recording studios, restaurants and shops. The delightful Luna Park has graced Sydney Harbour since 1935. This iconic amusement park has plenty of rides and games that have put smiles on hundreds of faces, young and old! 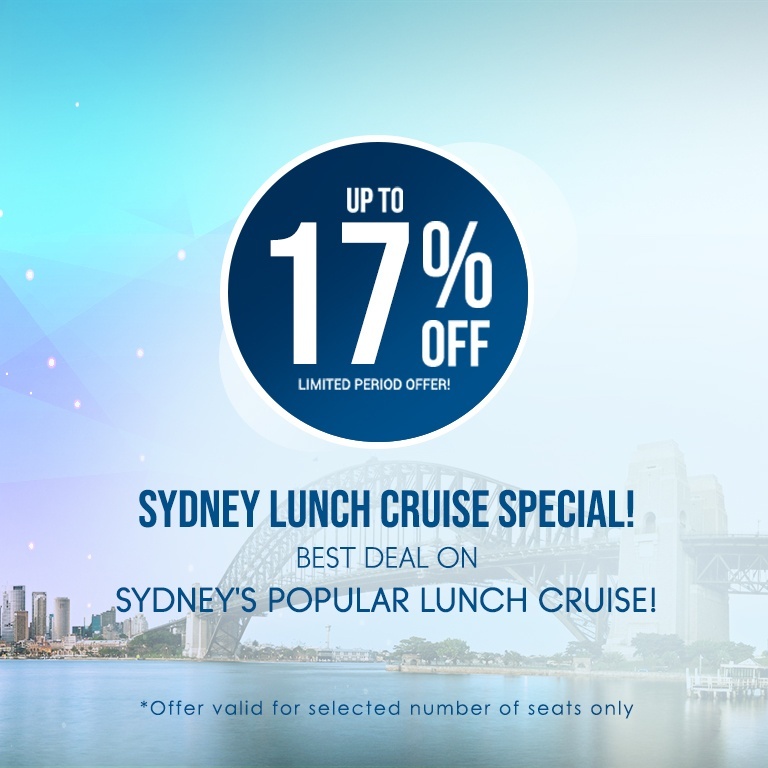 When you book a 2hr 15mins lunch cruise, you have the option to upgrade for a 2hr 15mins cruise extension at just $17.50 (original price valued at $35). Please Note: The second part of the cruise is identical to the first part of the cruise, as our cruises operate primarily in the main harbour, East of the Harbour Bridge. The vessel will have three stops; King Street Wharf between 2pm-2:15pm; Circular Quay between 2:35pm-2:45pm and a short stop at 3:45pm. The additional stops are to facilitate the boarding and disembarking of our 2hr 15mins & 1-hour sightseeing passengers.
" we thorouly enjoyed our cruise and to make even better the weather was glories the staff was very efficient and plenty of food for everyone and well presented with choice. we would definitely do this cruise again when we visit Sydney "
" I worth it experience :), We both enjoyed it very well! The asian Lady was very effective and accommodating same with the two young boys. Food was great. Love our seats too! Perfect day! " " I rarely give such a high number of “excellent” ratings. However, we really did think it was EXCELLENT. Next time we want to go on a lunch or dinner cruise, your company is the first company we will contact. " Australian Cruise Group has been operating on Sydney Harbour since three decades. 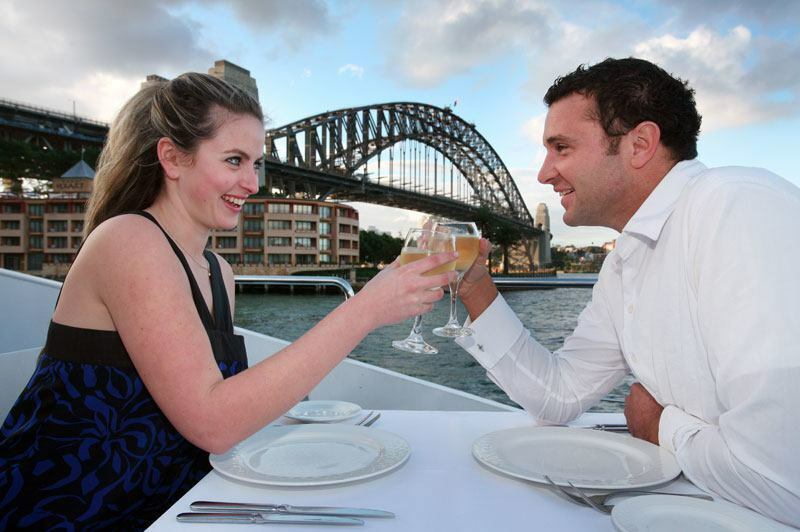 With over 5 million happy customers, it has been recognized as one of the leading cruise companies in Sydney. Magistic Cruises is owned and managed by Australian Cruise Group. 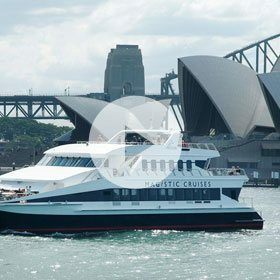 The 2 hour Sydney Harbour lunch cruise from Magistic will be onboard one of the best Australian-built luxury catamarans. We offer a sumptuous buffet that's freshly prepared onboard by our Chefs. Reserved seating guarantees you a restaurant style dining. Our gourmet buffet menu features some of the best loved seafood dishes. 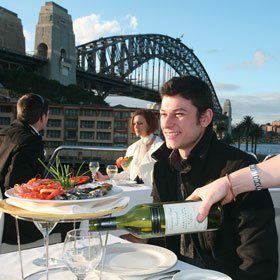 Our luxury catamarans include a fully licensed well-stocked bar to enhance your Sydney Harbour lunch cruise experience. 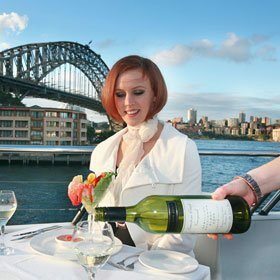 You are free to buy the beverage of your choice or opt for the beverage package as an add-on for an unlimited supply from our bar during the entire course of the lunch cruise on Sydney Harbour. We have a world class GPS system that gives you intermittent commentary as we pass the major landmarks around the harbour. The informative narration helps you know more about the amusing culture and history of Sydney. The climate-controlled cabin keeps you comfortable during the course of Sydney Harbour lunch cruise. Our cruises are child-friendly. The wide windows provide an amazing view of the harbour as you relish your buffet. We have 3 spacious decks onboard and they help provide the best view of the entire harbour. The photo opportunities from these wide decks are one of the major attractions on the cruise. We ensure picturesque view of the entire Sydney skyline. The Sydney Opera House, the most popular landmark in Sydney, is best loved from the Sydney lunch cruise. As we cruise under the Harbour Bridge, it lets you admire the engineering marvel of this enormous structure. You also get to see various other landmarks such as Luna Park, Fort Denison, Shark Island, Taronga Zoo, The Rocks and Darling Harbour before we arrive back at King Street Wharf for the drop off. 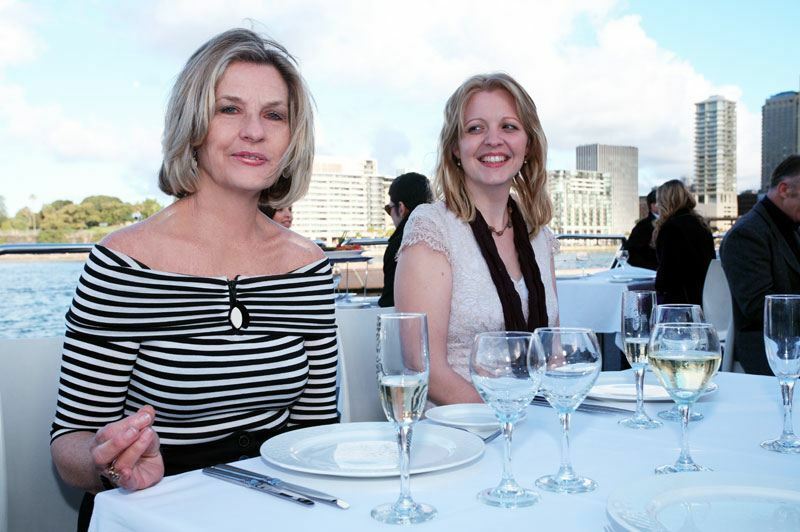 Sydney Harbour lunch cruises are worth every penny you spend. 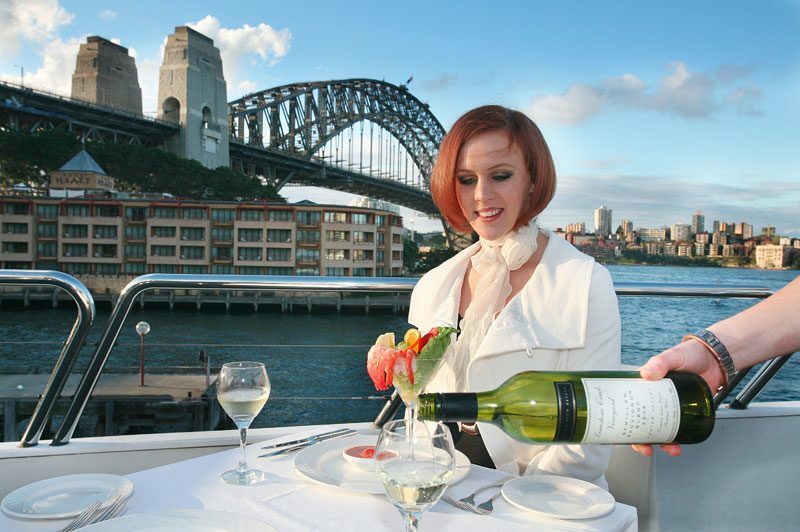 Our well-trained and helpful staff will take care of your every need onboard Magistic Sydney Harbour lunch cruises. We believe every customer is unique and we ensure the best quality service from the very first moment you reach us. 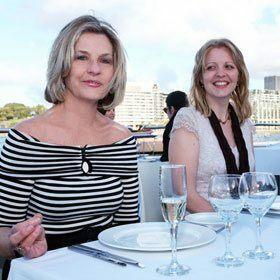 The lunch cruise on Sydney Harbour is an amazing alternative to any waterfront restaurant as it is a wonderful experience. We guarantee the best cruising service for the best price (only $79) you can think of. We assure great food, best beverages from the country, amazing service & the best view of the entire Sydney Harbour landmarks as you dine!